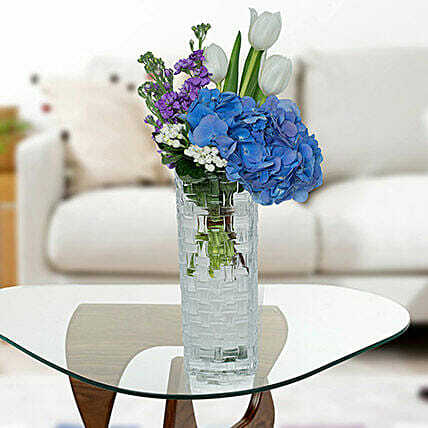 The alluring arrangement of blue Hydrangea and white tulips in a premium glass vase is perfect to decorate your home. Get it online to gift to your friends or relatives on their anniversary or housewarming party to accentuate the look of their house and make it look awesome. Premium Glass Vase Arrangement of 1 Blue Hydrangea, 3 White Tulips with Stock Flowers and Bouvardia. When your flowers arrive, just trim the stems and add water. Re-cut 1-2” of the stems at a 45 degree angle. Use a clean vase and clean water. Remove the leaves below the waterline but do not remove all leaves along the stem length. Check the water level daily and replenish as needed. Don’t place flowers in direct sunlight or near any other source of excessive heat. All flowers benefit from a daily mist of water. Enjoy your flowers!